This cute kitty is rendered in cloisonné enamel and 22 karat gold. Show your love for your feline friends with this adorable cat pendant. 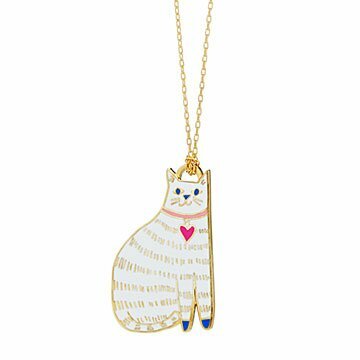 Rendered in cloisonné enamel and 22-karat gold and suspended from a gold-dipped chain, this cute kitty makes a charming addition to any cat lover's collection. Designed by Christine Schmidt; made in San Francisco. I get so many complements! Such a cute kitty necklace! I get complements every time I wear it. The length is long which I prefer and the charm is on the chain in a way it doesn't shift during the day. Loved this necklace so much I almost kept it for myself. Very cute and I like the long length chain. My friend likes it very much. I bought this for my daughter for Christmas/Hanukkah, so she hasn't actually worn it yet. As she loves cats, I'm sure she'll love this.